How the journey to happy hour turned into the happiest part of my day! As I've gotten older, I've found that one of life's happiest moments is the handful of hours between 3 and 6pm on a weekday: happy hour. But this week, happy hour got a lot happier in the hour that preceded the birthday dinner my friend and I shared. Last Thursday, I planned to take my friend out to a semi-swanky bar/grille for her 22nd birthday. Since we both work in downtown Chicago within blocks of each other, it was only a little past 2:00pm by the time met up. Happy hour didn't start until 3:30; with an hour and a half to spare, we mulled over ideas on what to do until then. Being inventive, we tried a number of tactics to waste time. First, we decided we'd walk at half speed the entire length of our trip, thus doubling our 17-minute long walk into 34-minutes of too-chill sauntering. Of course, this didn't work as we're so accustomed to speed-walking through the crowded city streets - rushing our lives away... but I digress. Instead, we decided to stop along the bridge over the Chicago River to take selfies. Obviously, this didn't take more than a few minutes, so we continued on our trek wondering how else we could waste time. Next, we saw a bubbling fountain spitting royal blue dyed water into the air, so naturally, we had to touch it. My fingers turned blue and something touched her hand. Ew. At this point, we were three minutes out from our destination, but still had about 45 minutes to kill. Defeated, we came upon a place where we could spend time while having the time of our lives - the Anti-Cruelty Society Chicago! At the Anti-Cruelty Society, cats and dogs are taken in, either as strays or animals that have been given up, and cared for while waiting to be fostered or adopted (as well as so many other things!). We decided to head inside and visit with all of the beautiful animals cooped up on this lovely, brisk Autumn day. As she is allergic, and simply not a cat person, my friend and I signed in at the front desk and immediately split - she went to the dog room and I went to one of two cat rooms. In the first cat room, there were two calico girls eager for a visit. (Calico is a coloration, not a breed). These two cats were clearly related as they were paired together and looked alike. They got along very well, were quiet - but curious, and enjoyed the fact there was somebody there to see them. The room was well-furnished with a cat tree/tower fit for queens, endless toys, snacks, water, soft beds, and good hiding spots - a paradise for any cat. Immediately, I took to these two beautiful calicos as they reminded me of my cat, Schön. These cats were not only friendly but playful. The older of the two was more receptive to petting and playtime, but once I began paying attention to her, like clockwork, the younger cat got a little bit jelly belly and came to rub my hand as well. For about 25 minutes, I played with, spoke to, and paid attention to these beautiful kitties as they purred and played and basked in the attention they are clearly starving to receive. That's not to say they aren't well tended to because they certainly are! Still, these cats crave attention and affection as any normal sentient being does, but don't get it as frequently or as regularly as a pet cat does in a permanent home. When it was time for me to gather my things, I said goodbye to the cats as they rested peacefully in their tower, tuckered out from running and playing, and decided to take a quick stop into the other cats-only room. The other room was less luxurious than the first one as this room was more of a holding center for new intakes, cats who still needed some extra medical attention or those who weren't as social as the other two. So I went around to every cage and spoke to all of the cats who were awake - (I didn't want to wake the sleeping beauties!). I then came across a handsome boy who I wanted to say hello to on a more personal level. After reading the outside of his cage, I found out that his name is Mojo. He meowed softly when he saw me the first time, which is when I knew I needed to spend some time getting to know him outside of the cage. 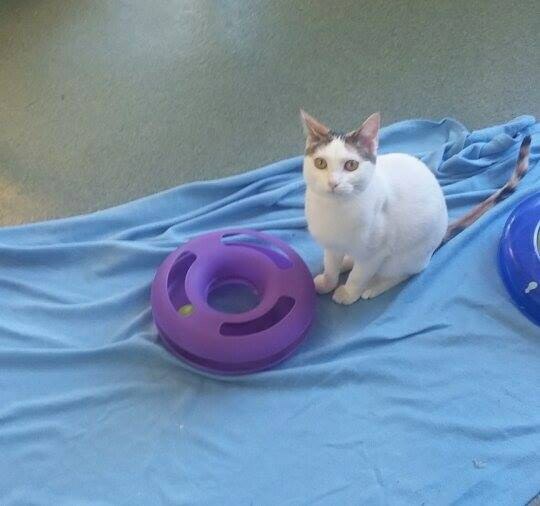 I asked one of the workers if we could have a little time together; he said yes, directing me to a side room where prospective adopters could have the opportunity to become more acquainted with the cat of their choosing. After having noticed my extended absence, my friend came to find me, braving her allergies just to say hello to Mojo as well. Instantly, he rubbed all over her calves and shoes, thus marking her with his scent and letting her know he liked her, too. It was clear that little Mojo was a loving cat who enjoyed the company of two enthusiastic pet lovers. Though our encounter was unplanned, it was definitely the highlight of our day. And because of our spontaneous visit, we decided that when the semester is done, we want to come back to volunteer at the Anti-Cruelty Society - or, at least come see the animals who are waiting for their forever homes. Even if you don't have room in your home, your landlord won't allow it, or money is too tight right now, you can take baby steps in making a difference in these pets' lives. We didn't do anything extraordinary, but I can guarantee you that the hour we spent giving well-deserved attention to these precious fluff babies was as much needed for them as it was needed for us. Petting and talking to animals is cathartic and a better cure-all for stress that no amount of alcohol could ever match. So as for happy hour, I guess you could say we had two that day. Though our drinks might have only been $6, our precious moments with these animals was infinitely priceless.